As a stylized mashup, Abraham Lincoln: Vampire Hunter (hereafter just Dishonest Abe) doesn’t live up (or down) to its titillating premise. Re-imagining the Rail Splitter’s life as a revenge quest against the coven of vampires who killed his mother and, later, threaten the Union, the film is not without its provocative passages. But, this adaptation of Seth Graham-Smith’s 2010 epistolary-style novel, written as a faux-biography of Lincoln, distends from its self-serious plot and cartoonish presentation. Years after the death of his mom (Robin McLeavy), a vengeful Young Mr. Lincoln (Benjamin Walker) is recruited by flamboyant vampire hunter Henry Sturges (Dominic Cooper) with promises of retribution. Armed with a silver-lacquered axe, Abe swings into gory action, checking off Sturges’ hit list with nocturnal fury. Once Lincoln falls for Mary Todd (Mary Elizabeth Winstead) and gets a taste of politics, however, he holsters his hatchet and sets his sights on higher office, where Lincoln hopes to take a holistic approach to exorcising the bloodsuckers intent on taking over the United States. Director Timur Bekmambetov (Pride and Prejudice and Zombies, seriously) only hints at the campy fun that should have been the film’s heartbeat, first during a chase and battle through a horse stampede, and later onboard a runaway munitions train that somehow travels at the same speed as The Underground Railroad (watch and you’ll see what I mean). But with decades of vital American history to traverse, Dishonest Abe soon adopts a cursory countenance that makes for—dare I say—dull viewing. Walker is fine as the early unknown Abe, but it feels like he’s just playing dress up as the bearded, rutted 16th president brooding over, well, everything. 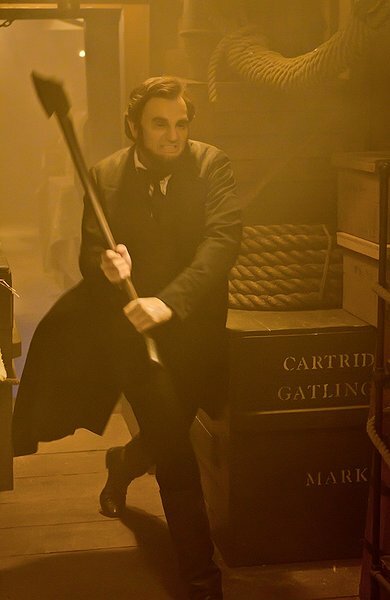 Moreover, shoehorning the scourge of slavery and the whole of the Civil War under the rubric of a (un)death struggle against Nosferatu proves more kitschy than clever, down to the obsequious inclusion of Will Johnson (Anthony Mackie), Lincoln’s African-American boyhood mate and eventual 19th century edition of Reggie Love. The whole morass eventually devolves into a murky computer-generated spectacle—layered with needless 3-D, natch—lifted from the long-since tired 300 palette. Likewise, Dishonest Abe is drained of its energy and eventually becomes a bloody bore.